"A freak storm unleashes a species of bloodthirsty creatures on a small town, where a small band of citizens hole up in a supermarket and fight for their lives." Those of you who, unlike me, are still fans of "The Walking Dead" already know that at least three of its regular cast members also appeared in Frank Darabont's adaptation of Stephen King's "The Mist". In fact, if you just replace the zombies with weird creatures in a fog, the whole group of bickering people in this film is almost identical to everyone in "The Walking Dead" anyway. 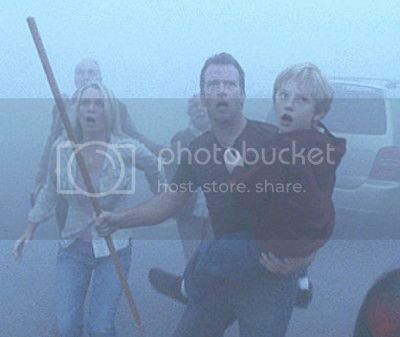 Having now managed to take my quick swipes at the nepotism and lack of originality in "The Walking Dead", I'll hasten to add that I had a great time rewatching "The Mist" even though I didn't like it when it first came out. Call me old-fashioned, but I actually enjoyed Stephen King's novella when I first read it way back in "Dark Forces" from 1980 but less so when I found myself reading it again in "Skeleton Crew" five years later. By the time the movie appeared, I was very familiar with story, had imagined how all the characters would look, and was very disappointed. I suppose that's always the problem with watching any movie adaptation of a book. I'll just mention that the version I have of "The Mist" is the standard R-rated single disc edition and not the super-duper "Two-Disc Collector's Edition" with a black and white version of the movie on the second disc. If I wanted to watch "The Mist" in black and white, I'd either have to adjust the colour controls on my computer or buy an old black and white television from a yard sale. I can't really be bothered to do either. I really don't like black and white movies that much and it would be pointless now that I've already seen the normal version of the movie at least three times. Anyway, before I say why I enjoyed "The Mist", let me point out that it wasn't just because of Laurie Holden. That would be too predictable so allow let me make you feel worried by saying that the hottest actress in the movie for me was Marcia Gay Harden who played Mrs. Carmody. Sometimes batshit crazy is sexier. Honestly, the stand-out performance in "The Mist" belongs entirely to Marcia Gay Harden. Even though she's the woman you love to hate, there is nobody more memorable. "The Mist" really is a "by the numbers" straight-to-DVD movie as far as the other acting performances go. Just because it had a budget big enough to turn it into a theatrical release instead doesn't change my assessment there. It looks like a SyFy channel movie for the most part too. If you don't believe me, just look at the CGI creatures. They are actually pretty great on the small screen but not so effective in a cinema where they mostly look like something out of a computer game. The slight fuzziness of a DVD when played, in particular, on a CRT television evens the effects out quite nicely and makes everything feel more claustrophobic. Playing the DVD on my massive HDTV doesn't work quite so well, but it's less jarring than I expect the Blu-ray would be. If you have the Blu-ray, please let me know how it looks. The biggest difference between the novella and the movie is, of course, the ending. Both are quite bleak, but Frank Darabont really went for the final shock and twist rather than the faint hope that Stephen King imagined. I'm not sure which I prefer although I was annoyed with the written version for not wrapping things up so neatly after God knows how many hundreds of pages I read. I'm going to recommend "The Mist" primarily to Stephen King fans and even to H.P. Lovecraft fans (since the influence is obvious). 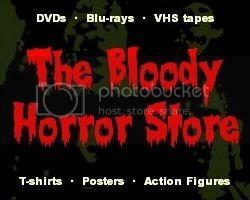 For the average horror fan, I'd say it would be quite entertaining too. It's not the scariest movie ever, but, personally, because I hate bugs and spidery things, it works for me.